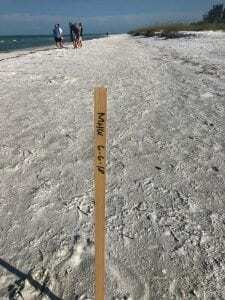 ANNA MARIA – The wooden survey stakes recently spotted along the beach north of the Sandbar restaurant pertain to storm erosion monitoring and not to any disputes over private beach rights, according to Anna Maria Mayor Dan Murphy. The survey stakes designate the mean high-water line along that area of beach. Murphy said the survey information will help the city monitor storm erosion. The beaches in that vicinity, near the Coconut Avenue beach access, sustained significant erosion during Subtropical Storm Alberto. 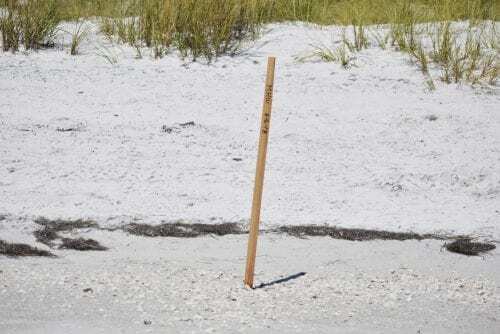 Anna Maria resident and Sun Advertising Director Chantelle Lewin spotted five survey stakes north of the Sandbar restaurant during her daily beach walk on Saturday, June 9. Lewin said the stakes raised concerns as to whether they pertained to beach access disputes. One such dispute arose in April along the 500 block of South Bay Boulevard, where the strip of sand between the beachfront homes and Tampa Bay is very narrow. The mean high-water line establishes property lines along beaches that have not been renourished, including most of the bay side of the Island. The erosion control line (ECL) establishes property lines in areas where beach renourishment has occurred, including most of the Gulf side of the Island. A walk along the beach Wednesday afternoon from Palm Avenue to Bean Point revealed only one remaining survey stake. It was near the Elm Avenue beach access and stood far from any residences, with dunes and vegetation in between. The handwritten inscription on the remaining stake said, “MHW 6-6-18,” in reference to the mean high-water line and the survey date. The city was also provided with the GPS coordinates of the mean high-water line. 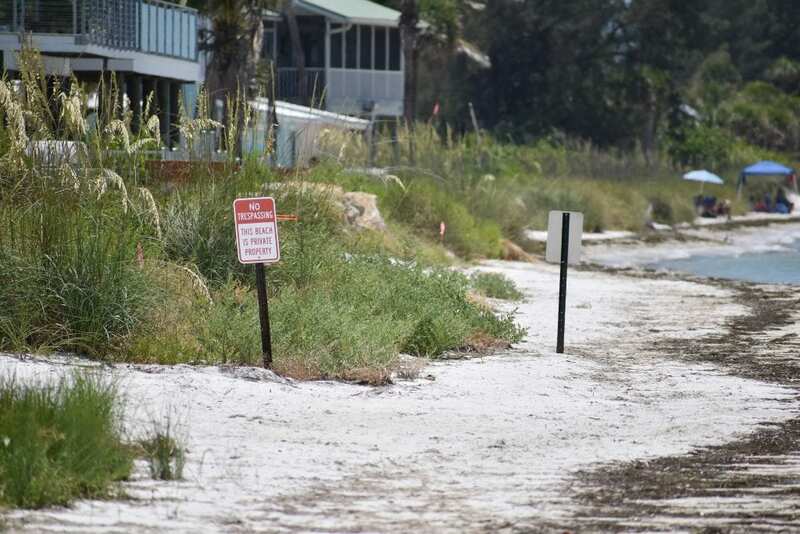 Manatee County Parks and Natural Resources Department Director Charlie Hunsicker said beach property landward of the mean high-water line or the erosion control line is private property – unless it’s in front of a public park or a designated public beach. Land seaward of those lines is state-owned public land, he said. 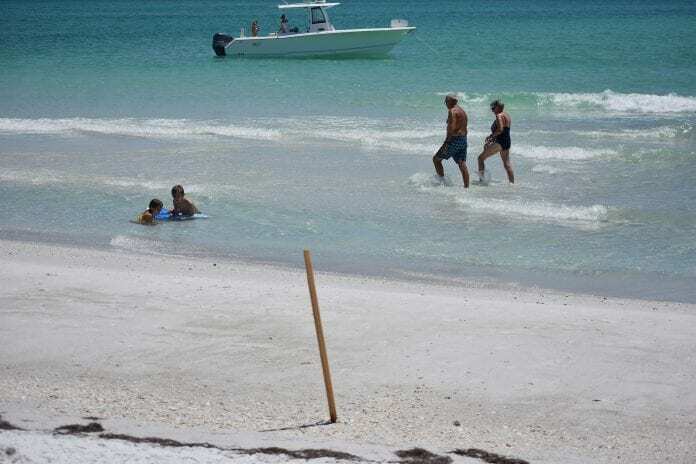 Hunsicker said the erosion control line proposed for the city of Anna Maria in 2001 for beach renourishment in 2002 begins between Sycamore and Elm avenues and extends to the south, terminating between Oak and Maple avenues. “At the time we had the hearings, while water was hitting the windows of the Sandbar restaurant, the properties to the north said, ‘We’ve got plenty of beach. We’re not worried about it so we don’t want to enroll.’ You couldn’t force them,” he said. “The erosion control line is recorded on the deeds of the properties with the Clerk of the Court and is a line established by state and local governments working together, following a public hearing. Wider beaches created by that renourishment would then be in the public domain,” Hunsicker said. Beaches outside of the ECL boundaries are not eligible for beach renourishment projects funded by various county, state and federal agencies, he said. The Anna Maria beach area washed away during Subtropical Storm Alberto “…will not be renourished until there’s a formal ECL and a state declaration that it’s eroded,” Hunsicker said. In early May, Murphy requested city-funded surveys of the mean high-water line at a beach access along the 500 block of South Bay Boulevard. He also requested a survey in front of a beachfront home on that block where disputes had occurred between the property owners and those walking on the residential beach not far from the Anna Maria City Pier. On Wednesday, visits to the beach at Bayfront Park and along the entire stretch of beach on South Bay Boulevard revealed no existing mean high-water line survey stakes. Only the pre-existing no trespassing signs in front of the home in the 500 block were visible.